What are NOT Knowledge Requirements? What are Tools and Equipment Requirements? What are NOT Tools and Equipment Requirements? What are the System Requirements to use RealEstateSiteCreator? When and from Where can a user make changes or update the Site? How long does it take that Changes take affect? How can I create or update my website? Can I FTP or upload/download my files directly to/from the server? Can I get my files, if I decide to cancel my account? What is RealEstateWebSiteCreator? RealEstateWebSiteCreator is a powerful and yet very user-friendly web-based tool that allows authorized company users (e.g., agents, managers, admin, ...) to develop, maintain and update their team web site Automatically and Instantly without having knowledge of any computer programming, web design languages; and without requiring any web development tools or software. This is achieved by just filling forms, selecting desired options and clicking buttons. Updating and uploading pictures and documents can be done from any computer with Internet access at any time. Traditionally, companies have a dedicated webmaster, responsible for developing and maintaining their web sites. Any changes or updates is communicated to the webmaster, who in return will update and upload changes to the hosting server when (s)he gets time, usually after 1 business day or so. Depending on the amount of update data and schedule of the webmaster (who usually is a volunteer) the updates could take much longer time, sometimes weeks or months. RealEstaeWebSiteCreator reduces such a workload burden on one person, eliminates duplicate works and allows the authorized users to directly input information to the site on the fly. For example; the company administrators can authorize all agents or manager to update and maintain their own group property listings and web pages. In this case, they keep up-to-date group property listings, schedule of events, announcements, or event pictures, instantly. If your company's admin is not available or takes a break, your site wouldn't be out-dated. Updates can be performed by any authorized user at any day/time and from any place, as long as they have access to Internet. Basically none. As long as you can read, fill in the blanks, and are able to click desired buttons; you are ok.
FTP (File Transfer Protocol) for uploading or downloading pictures and documents to/from Server. Basically none. As long as you have a computer and access to Internet, you are ok.
What are the System Requirements to use RealEstateWebSiteCreator? 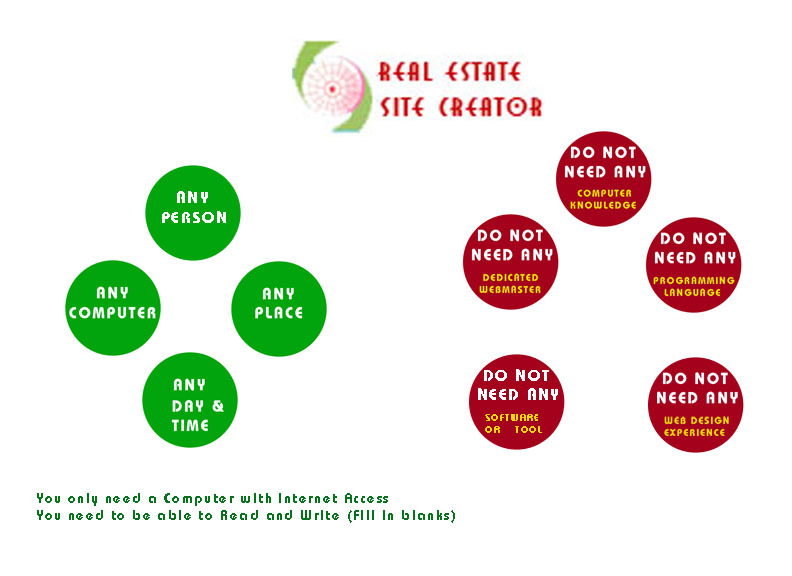 RealEstateWebSiteCreator is a web-based tool. All you need is a computer and an Internet connection. There is no software to install or storage space required. If you are reading this message from your computer you have everything you need to use RealEstateWebSiteCreator. When and from Where can an authorized user make changes or update the Site? You can update your site any day of the week and any time of the day (365/24/7) from any where, as long as you have access to Internet. You are NOT Restricted to use your office computer or office tools or be at your office or at your home to make changes. How long does it take that Changes to take affect? Immediately. RealEstateWebSiteCreator provides user interface to the DataBase, which allows changes register to the Database and shown immediately. -How can I create or update my website? Step-by-step instructions on how to do things are available under the Help menu. Yes. You can have as many domain names as you like pointing to your site created by RealEstateWebSiteCreator. For example if you already have a domain www.yourcompany.com and www.yourcompany.net, both of them can be used to access your site created by RealEstateWebSiteCreator. No. RealEstateWebSiteCreator will get your desired domain name (as long as is available) and will host it for you. No. All your pages will be created automatically by filling forms, selecting options, etc without directly accessing the server. You are not allowed to access the programs, files, directories and/or to source codes on the server. -Can I get my files, if I decide to cancel my account? Upon written request within 7 days of cancellation, we will provide you the latest Documents and Pictures you have uploaded to the server. Please note that other files that are created automatically by filling forms and clicking options, etc from RealEstateWebSiteCreator will not be retrieved and will not be provided to the user. Several service plans are available and are based on the number of groups in your organization. Please see available services for plan details. You can contact us through via email at: admin@RealEstateWebSiteCreator.com, phone: 214-457-3052. First you need to contact RealEstateWebSiteCreator and subscribe to our services, RealEstateWebSiteCreator establishes an account, set up necessarily directories, sub-directories, and provides the SITE ADMIN (Super user) an unique user id and password. The Site admin, then can do any and every item listed under "features". The instruction on how to use or do each feature described under "help" menu.